Project Orion was a US project to develop a spacecraft powered by nuclear explosions. Although it may sound implausible at first glance, research carried out by leading scientists and engineers of the day, including Freeman Dyson, indicated that such a project was not only feasible but would vastly outperform any chemical rocket system ever developed or even conceived - including Saturn V (used in the Apollo program), the Space Shuttle, and the new Ares system which is still under development (the crew module for Ares is also known as "Orion", but it is unrelated to the original Project Orion). It should also be noted that supporters of Project Orion included Werner von Braun, who of course developed the German V-2 rocket and later became a leading figure in NASA. Werner von Braun was reportedly initially skeptical, but later became an enthusiastic supporter of Orion. Other prominent supporters of the project, included the Nobel prize winning physicist Niels Bohr, visionary and author Arthur C. Clarke, and the then head of US Strategic Air Command, General Thomas S. Power. 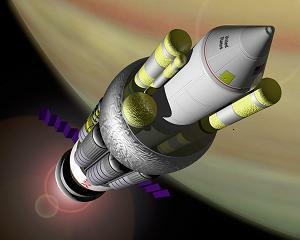 A single Project Orion mission would have been sufficient to establish a large permanent moon base. Project Orion aimed for a manned mission to Mars by 1965. Project Orion aimed for a manned mission to Saturn by 1970. A ship powered by the Orion drive could have travelled to Pluto and back to Earth in less than a year. (by contrast, NASA's New Horizon's space probe took more than 9 years to travel to Pluto from Earth, with absolutely no prospect of ever returning). The spacecraft envisaged for Project Orion were single-stage and entirely reusable. Unlike Saturn V, the Space Shuttle, Ares, etc., there are no discardable fuel tanks or booster rockets. In Project Orion, the entire craft would travel to its destination, regardless of whether that is Earth orbit, the moon, Mars or Saturn. Project Orion plans were developed for craft varying in size from 300 tons (the smallest version) to 8,000,000 tons (the size of a small city). By comparison, the Shuttle orbiter has a mass of approximately 110 tons and ould carry about 30 tons of payload into low Earth orbit, and the Saturn V rocket could launch about 120 tons in low Earth orbit or 50 tons into lunar orbit. Including development and all other costs, Project Orion was estimated to be at least 20 times cheaper per pound, than any chemical rocket, at putting payload into low Earth orbit... and vastly cheaper for more distant destinations. The scientists working on Project Orion didn't just plan to send a few highly trained astronauts on space missions; they intended to go themselves to Saturn, in many cases taking their wives and children with them! Despite its promise, and despite the fact that is was backed by many prominent figures in the physics and space community, Project Orion never progressed beyond research (the research indicated the project was entirely feasible). The project was outmanoeuvred by its opponents, and killed for political reasons. To discover more about Project Orion, please use the menu on the left of this page.